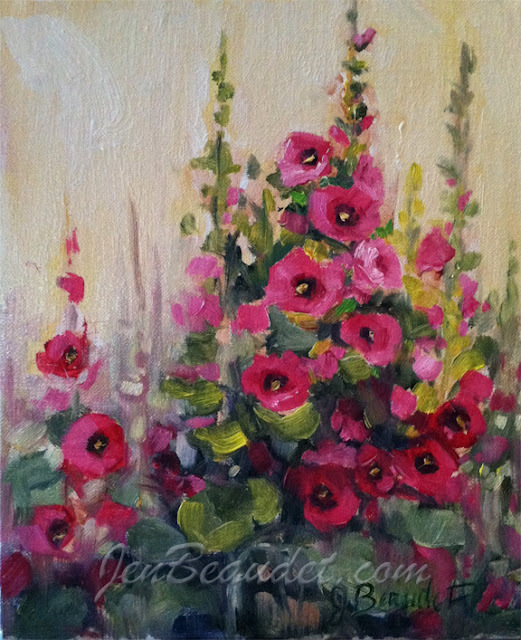 This is my latest painting of hollyhocks. It's my first time painting them but won't be the last! They're so much fun to paint! It was done with oils on linen panel and I only use a palette knife for the stamen in the middle, everything else was painted with a new bright brush. I wish brutes stayed new forever. I'm a little messy with my brushes and although I do try, I just can't seem to keep them sharp for long. I've been holding off buying some really good ones for this reason, but read somewhere that good brushes are the most important thing about painting. I wonder if that's true. The painting turned out just amazing. The colors are so vivid , really pretty!